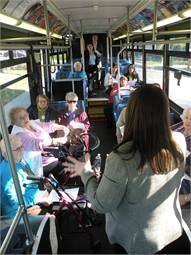 The Riverside Transit Agency’s travel training instructors work individually and in groups until the clients are comfortable using its regular fixed-route services. Launched in November 2011, Calif.-based Riverside Transit Agency’s (RTA) travel training program is effectively steering a growing number of customers away from its costly Dial-A-Ride service as well as saving the agency money along the way. 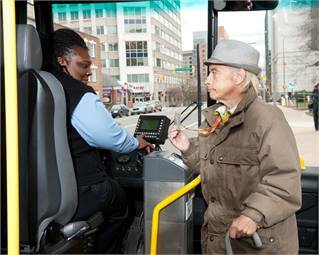 As part of the program to get disabled customers on the bus, RTA develops individualized travel plans for each participant, with a variety of lessons, including how to read bus schedules, pay fares and connect with other routes. Travel trainers also teach seniors the same lessons, but often in group settings, such as at adult day health care centers and senior living communities. Personal travel trainers customize the learning experience to meet each person’s individual needs. The step-by-step process emphasizes safety, while building confidence and travel skills. Travel training involves a series of steps from initial one-on-one instructor assistance to gradual empowerment of the individual to, ultimately, independent travel. The total time spent on training is based on the individual’s needs. Instructors spend as much time as necessary to ensure each person is comfortable with traveling on their own. The program was funded through a federal grant and developed and marketed through multiple partnerships. Since its November 2011 launch, approximately 450 people have taken the RTA’s travel training, with another 300 either currently in training or on a waiting list. In about a year-and-a-half, the program has generated 33,678 trips. Additionally, with the average cost of providing fixed-route service coming in at $5 per passenger compared with $26 per passenger, the RTA has saved approximately $300,000 alone this fiscal year. Furthermore, RTA estimates it saves an estimated $14,000 a year for every five-day-a-week rider who makes the switch from Dial-A-Ride to fixed-route services. More importantly, the program also saves the RTA’s customers money. The agency estimates that a person riding fixed-route buses five day a week spends less than $300 annually for a disabled/senior bus pass, while that same person would spend at least $1,560 on Dial-A-Ride service. For all of these reasons, Weaver suggested that implementing a travel training program is a win-win for everybody involved. Travel training is intensive, one-to-one instruction designed to teach people with disabilities and older adults how to travel safely and independently using public transportation. Four levels of travel instruction that transit agencies could consider providing include: transit orientation; transit familiarization; travel training for an experienced traveler or new traveler. Does the candidate have a sensitivity to the needs of customers to be taught and an ability to be supportive of those needs? Has the job candidate completed any structured course or training offered by a recognized vendor? Has the candidate had experience in all phases of travel instruction? Is the candidate experienced with the transit system that she will be instructing customers to use? Does the candidate belong to any professional associations, such as ATI, through which he can participate in ongoing professional development activities? For additional resources, visit www.projectaction.org.